Do you find it hard to say ‘No’ to a colleague, a friend or a loved one? Most people assume that saying ‘No’ is an easy process, however for many this could not be further from the truth. 1. Fearful of disappointing or hurting someone. Sometimes we do things that go against our own desires just to make others feel better, even without us realising. We often unconsciously make choices in life to our own detriment just to please our parents, husband, wife, partner, boss or friends because we want to make them happy. We find it hard to say ‘no’ especially to our loved ones, as if they will stop loving us if we say ‘no’ to them. 2. Avoid conflict. Many of us are fearful of conflict. We don’t want others to be critical of us or angry with us when we say ‘no’ to a request. We want to do everything and anything to avoid the unpleasant feelings that come with being in conflict. For some people, turning down a request is not politically correct because they think that saying ‘no’ puts them into conflict and they always need to show up as the ‘good’ person. 3. Want to get along with the crowd. We often have difficulty saying ‘no’ because we want to get along with everyone. We have the desire to be accepted and be liked by others. We don’t want to ‘rock the boat’ so we do what others are doing to avoid rejection or become the odd one out instead of saying ‘no’ because we have a different opinion. Consequently, we are pressured to compromise our principles because we don’t want to be seen as someone who is difficult to get along with, or someone who does not play well with others. 4. Desire for recognition. Saying ‘no’ may be perceived as a sign of weakness, selfishness or incompetency, we either believe this to be true or we fear others think it of us. We want to be seen as someone capable so we say ‘yes’ to a request even if we can’t fulfill the task in that moment. At work we don’t want our colleagues to think of us as ‘unsupportive’ or not a ‘team player’. We find it hard to say ‘no’ in these situations because we are constantly looking for recognition and to be accepted. This is especially true for people with low self-esteem who feel insecure about their career. 5. A constant unspoken expectation of a ‘yes’. When we are asked to do something, we often get a sense that it is more of an instruction than a genuine request. This is because the person who is asking has already assumed that we will say ‘yes’. So we are pressured to become submissive to this unspoken expectation especially when it comes from someone in authority, or someone we see as ‘above’ us. With every ‘yes’ we speak that has a ‘no’ underneath we encourage people to keep expecting our yes’s. Overtime this expectation in the other becomes a habit as they come to believe we will always do everything we are asked and we become trapped in our ‘yes’. 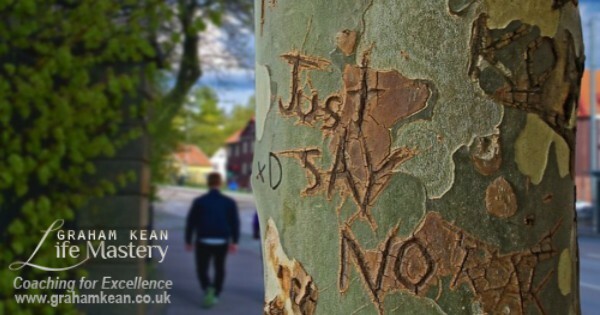 The difficulty we have in saying ‘no’ to a request is not a personality trait that comes naturally. In fact, it has a deep roots in our upbringing and parental care system. As children we were told not to go against authority. We were taught to follow what our parents told us to do. At school we had to do what the teachers said or we were punished. We became submissive not only because of the fear of punishment, but also because of a desire to please and be loved by people who are very important to us. We carried this programming with us into the adulthood and it has a powerful and negative impact on our relationships, leadership, career development and our general well-being. We say ‘yes’ for all the reasons above (and many more), but we often overlook the extent of the impact it has on us; it creates resentment, jealously, self loathing and depression. Even though it is so hard to speak there is real value in your ‘no’ and speak it you must. Find it hard to say ‘No’? It’s time to stand in the power of your ‘No’ and be aware of the pitfalls of your constant ‘Yes’. Become aware of your boundaries enabling you to stand in the power of your ‘no’, an essential skill in becoming a good leader. Consider all possible choices available to you before giving your answer to a request. This involves putting yourself first and offering your reply from your reality not what you think others expect of you. Have a mindful approach to requests made of you, especially in the workplace. Be able to create a professional and thought-out response which leaves the person making the request with a clear indication from you as to what you are prepared to do or why you are not prepared to do what is asked of you. Come from the place of awareness and clarity which will leave you less space for conflict and open up the possibility of healthy, stress-free interactions with the people in your life.